Fast-food and retail workers march Tuesday afternoon near City Hall as part of the launch of a local effort to fight for “Fair Workweek” legislation, which has been passed in San Francisco and New York and regulates scheduling practices for employers. Shaheim Wright wants to go back to school. The Northeast High School graduate is considering zoology. Or maybe biology, so he could take veterinary medicine courses. Most of all, he wants to get a college degree so he can get a better job. Right now, he takes care of the animals at the PetSmart at Cottman and Bustleton Avenues. But Wright, 19, says it doesn't seem possible to go to back to school. In part, because his work schedule is so erratic. "I can't go and apply for college if I don't know what days I can go to class," Wright said, adding that he fears that if he were to call out for a shift, he'd get fired. On a good week, he'll get put on the schedule for 30 hours. Other weeks, he'll get only 16 hours. It's impossible for him to predict. "I never know how much money is coming in," said Wright, who earns $8.75 an hour. Wright isn't alone: according to a recent University of California-Berkeley study on Philadelphia's service sector that surveyed nearly 700 workers, the average worker reported a 14-hour difference between the weeks they worked the most and the least. It's why Wright has joined a local campaign to push for city laws that will require employers to offer more consistent hours. He was one of about 40 workers and organizers who marched to City Hall just as the work day ended Tuesday to start the campaign, part of a nationwide movement that has won legislation in San Francisco, Seattle, and New York. "We're not just workers," campaign leader Madison Nardy said at the march. "We're mothers, we're caretakers, and we're even step-team coaches." Shortly after Nardy talked about Wright, he led three other members of the Northeast High step team in a performance in the middle of 13th Street, in front of cheering workers and advocates. Workers from organizations such as service workers union Unite Here, Restaurant Opportunities Center, and United Food and Commercial Workers Union came out to begin the local “Fair Workweek” campaign. 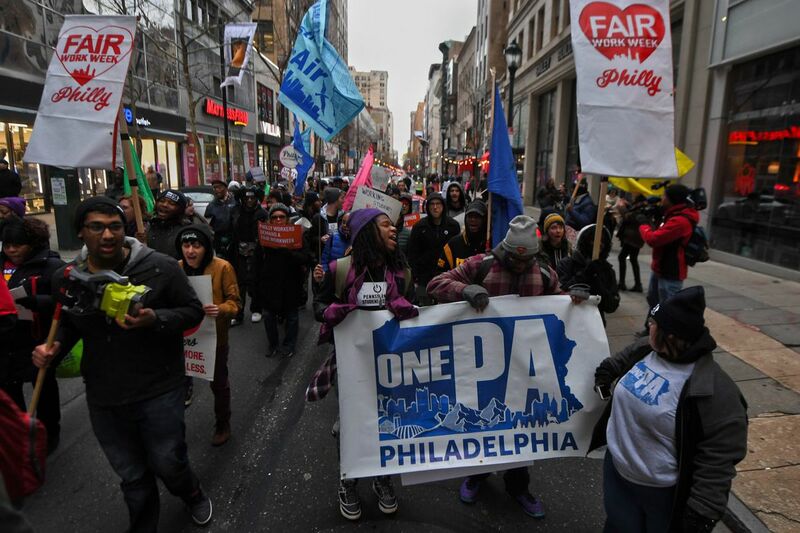 For the last six months, Philadelphia's "Fair Workweek" coalition, led by economic justice organization OnePA, has been organizing retail and fast-food workers from big box stores such as Gap, Target, and Walmart. It's an issue that is likely to have a particular resonance in the city, as the retail and hospitality industries are among the fastest growing locally, employing more than 124,000 people in 2016, according to the Pennsylvania Department of Labor and Industry and Philadelphia Works. This comes just after Mayor Kenney announced an ambitious plan to train Philadelphians and connect them to blue-collar jobs, with a specific eye toward the retail and hospitality industries. Much of the issues that advocates have decried across the country stem from algorithmic, or data-driven, scheduling. The consequence, advocates say, is that workers are held hostage by the technology. Cecily Harwitt, organizing director for OnePA, says the coalition has heard from hundreds of workers who feel as if they're punished if they don't leave their schedules wide open. There was the Aldi worker who asked to cut her hours down to 28 hours a week so she could take care of her newborn and is now consistently getting scheduled between 10 and 17 hours a week. And the Target worker who has had to turn down last-minute calls to come in because she couldn't afford the transportation that day. Zaire Best marches along fast food and retail workers on Tuesday near City Hall. "People's lives are just impossible to manage this way," Harwitt said. The food and hospitality industry contends that it's impossible to predict certain circumstances, such as the weather or whether the Eagles will win the Super Bowl. If employers are required to make schedules two weeks out, the way New York City's law stipulates, it would hurt the companies' bottom line, said Melissa Bova, vice president of government affairs for the Pennsylvania Restaurant and Lodging Association. Flexibility, she said, is an important part of the restaurant industry, one that benefits both workers and employers. As for employers, Bova said: "They're terrified." They don't want to lose that flexibility. Some corporations, such as Starbucks and Urban Outfitters, have changed their scheduling policies to give employees more predictable hours. A slate of City Council members, including Helen Gym, have called for hearings on the issue. The first is slated for Feb. 28. "An economy that's built off keeping people in unstable hourly shift work that changes from week to week in a way that's largely outside their control is one that begins to profit from poverty rather than transcend it," Gym said. "That's what we're trying to take a look at in a very serious way." As for Wright, he is nervous about losing his job for speaking out. But he has his eye on the bigger picture. "If losing my job means I can do something better for retail work in general, then it doesn't matter to me," he said.